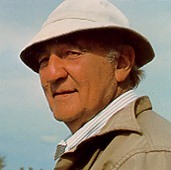 amuel Edmund Oppenheim (1901-1992) occupies a unique place in the history of American painting. 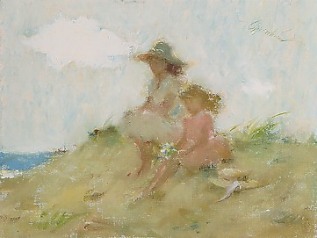 A thoroughgoing Impressionist, he was a student of Charles Hawthorne on Cape Cod and Harvey Dunn in New York. Another strong influence was Walter Biggs, the incomparable American illustrator whose freely-brushed watercolor paintings graced most leading magazines in the early decades of the Twentieth Century. Oppenheim was principally a painter of charming easel pictures which exude a gracious, mellow poetry. Several motifs recur with frequency in his oeuvre: mother and child in an idyllic landscape, beautiful women posing modestly in a gentle Victorian interior, lush floral still lifes, young ballerinas posing in stage costume, decorous nudes in a domestic interior. Oil on canvas, 59 x 30 inches. 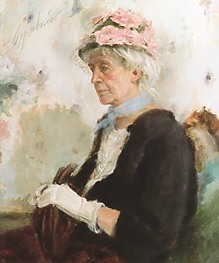 Lady in a Pink Hat, 1970. Oil on canvas, 30 x 25 inches. Oil on canvas, 22 x 30 inches. Oil on canvas, 9 x 12 inches. 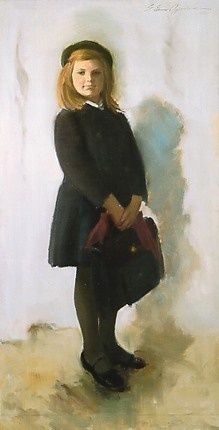 But Oppenheim also painted many portraits professionally, strong in characterization and rich in painterly qualities. These masterly portraits, hanging in public and private collections throughout the United States, firmly establish his right to be considered among the foremost American portraitists. It was his popular portrait classes at the Art Students League in New York, featuring his electrifying demonstrations, that created his enduring reputation as a teacher. I myself was a student in those League classes, and I credit Oppenheim with awakening my awareness of what painting is all about. From the very beginning, I set out to emulate the Oppenheim technique. The soft edges, the flowing brush strokes, the selective focus, the mystery and elegance of the conception, all this was fascinating. But behind it all was a solid, honest realism standing firmly on the bedrock of observation. "Observation is everything," he would say. "Look and see what is there. The model is the teacher in this class. She says nothing, but she tells you everything." Essential to the technique were two concepts: first, drawing is the key to painting. Behind everything is accuracy of observation in drawing and, second, the tonal values must be right. It must be right in black and white before it can be right in color. Exquisite color will not save a painting that is faulty in drawing and inaccurate in value. 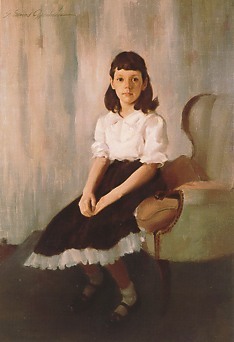 He was committed to the concept of the single-sitting portrait study as the basic discipline. 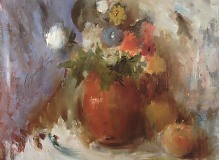 He felt that the urgency of the time constraint forced the artist to concentrate on essentials. We worked on a white canvas, mixing on a white palette. We made no preliminary drawing in another medium, but rather proceeded directly with the brush, blocking in the architecture of the head as simply but accurately as possible. Ten percent of the total working time was to be devoted to this drawing. Then we proceeded to lay in our main tones, working with the largest brush possible, stating the darks first, then the halftones, finally the lights. And always the valuesthe values! The values must be right! As he made his way among the forest of easels in the class, the commentary was succinct and direct, and invariably involved the values. "The eyes are too dark!" or "The highlight on the forehead is much too light!" "Look over there and see what is there!" 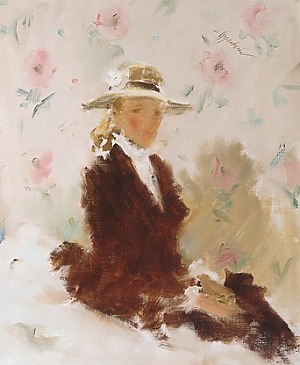 Woman with Flowered Background, 1988. The Age of Innocence, 1950. Oil on canvas, 57 x 40 inches. Samuel Edmund Oppenheim left an enduring legacy of student/disciples, and a body of joyous Impressionist paintings that continue to delight and instruct. "Paint the entire picture in one sitting, if you can." "The quickest way is the best." "Use as large a brush as possible." "Paint as large an area as possible at once." "Never paint on one thing too long." "Compose by masses of light and dark." "Paint neither too thickly nor too thinly." "Make the objects swim in the air." "The conception is what distinguishes the painting. Seek a noble and ample design." "Let the brush strokes flow." "Let the surfaces flow into one another." "Do you see that in the model? No? Then why do you put it there?" "Base everything you do on observationobservation alone!"